​As dark as the story of its name. 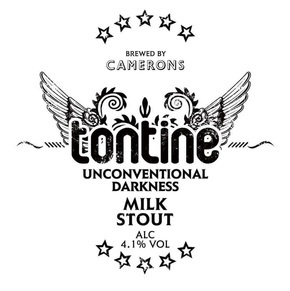 Tontine is brewed using chocolate & crystal malts making it a rich black stout that offers consumers a distinctive drinking experience. Instead of the heavy bitter finish associated with many stouts the introduction of milk sugars gives the stout a satisfying sweet finish. ​Road Crew is an American Pale Ale packed full of hoppy citrus and blackcurrant flavours delivering a fresh, crisp superior taste to celebrate the spirit of the song and those who inspired it. Motorhead for life! We have taken our classic milk stout recipe and infused this beer with fizzy cola bottles to give a truly unique flavour combination. The sweetness of the milk stout is contrasted by the tart fizzy cola bottle flavours. One not to be missed! ​ATTEN HUT!!! 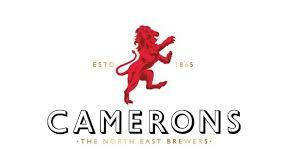 Camerons have created golden cask beer with a citrus aroma and satisfying full hop flavour. 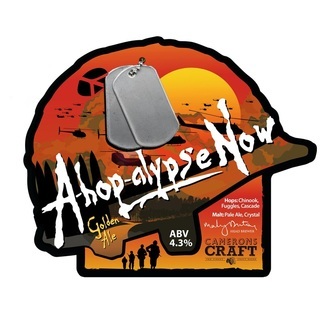 The Cascade, Chinook and Fuggles hops deliver an initial citrus flavour followed by a satisfying bitter taste.